If your curtain fabric is in good condition then why not re-use it – especially if you are moving house, or giving a particular room a make-over. Existing curtains can be shortened or lengthened, made wider or narrower. For curtain alterations of this nature, measure the window space as you would for new curtains. You may find our measuring page helpful. Curtain alterations involving the addition of a blackout or thermal lining to existing curtains can change their purpose, be a real energy saver and lengthen the life of existing curtains. I can supply a range of good quality lining fabric at a competitive price. Check our lining fabric options. Sometimes wide windows may require two sets of curtains. If you have bought ready-made curtains, having them professionally sewn together will provide a really good finish. Curtains can be "freshened up" simply by changing the curtain headings, particularly as trends change. 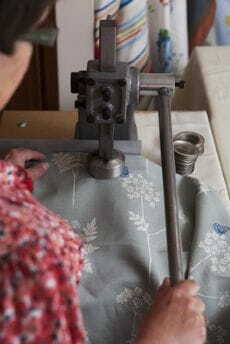 For example, altering traditional curtains to eyelet curtains is currently a popular request. 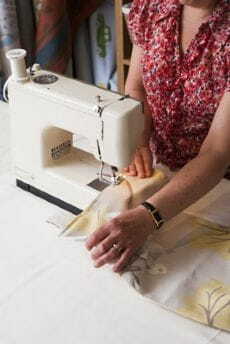 It is often possible to replace or add new tape or tabs to existing curtains or even change from pencil pleat to pinch pleat, providing there is sufficient fabric. Direct sunlight, dust and simple ageing weakens curtain fabric. The leading edges of curtains are generally where wear shows up first, but if the curtain fabric still looks good, there may well be ways of repairing rather than replacing your curtains. Convert to Roman blinds - More than just curtain alterations, good quality curtain fabric can easily be converted from curtains to Roman blinds. Something as simple as a new trim or custom-made tie-backs can revitalise tired curtains.